What is the story of Spare Parts? SPARE PARTS – What’s the story? Those guys and their teacher rock, love them, God bless them! Let’s hope the movie Spare Parts will get more people to embrace science! The film is directed by Sean McNamara and the cast includes George Lopez, David Del Rio, Carlos Pena, Jose Julian, Oscar Gutierrez, Marisa Tomei, Jamie Lee Curtis, Alexa PenaVega, and Esai Morales. The movie Spare Parts will hit theaters on January 16, 2015. It takes a team to build a dream. There are so many movies about underprivileged kids making it thanks to sports. Well, I wish they’d make more movies like Spare Parts instead! 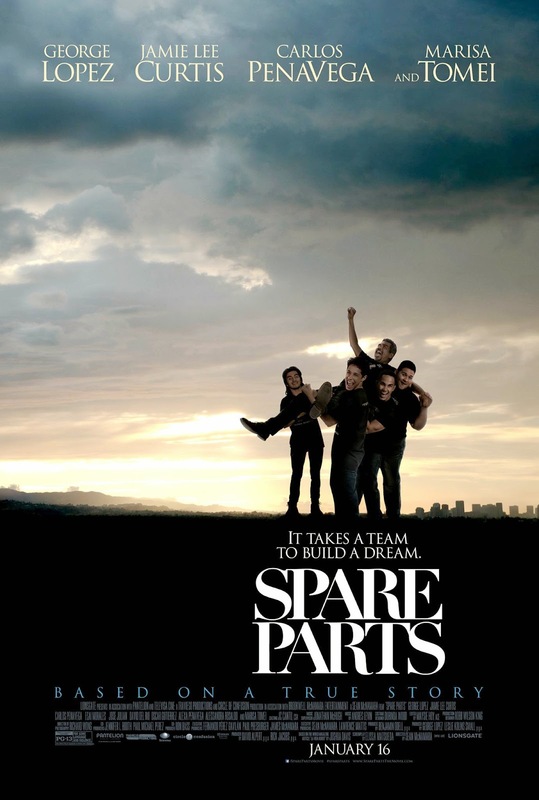 The movie Spare Parts will be released on January 16, 2015. Four high school students in Phoenix Arizona entered a NASA-sponsored robotics competition. But they had a dream! This is a really inspiring story. I wish it would be compulsory for students to see it, it would push more of them to turn to science and technology. The release date of Spare Parts is set to January 16, 2015.